Photo: Ritter House, ca. 1796, Beach Street, Vineyard Haven, MA. Listed on the National Register of Historic Places in 1977. Photographed by user:Cbaer (own work), 2008, [cc-by-3.0 (creativecommons.org/licenses/by/3.0)], via Wikimedia Commons, accessed June, 2014. 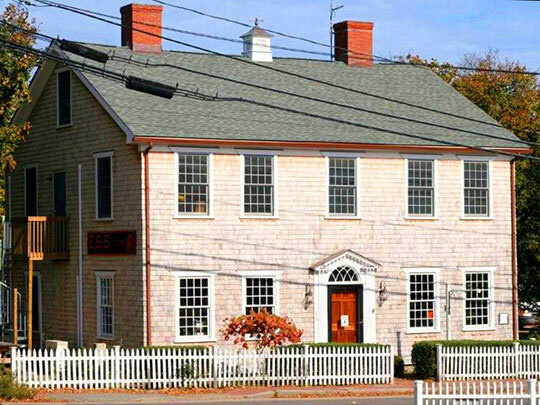 Dukes County administrative offices are located at 9 Airport Road, Edgartown, MA 02539; phone: 508-696-3840. Dukes County is comprised of the Gosnold Islands (Town of Gosnold) and the Island of Martha's Vineyard (Aquinnah Town, Chilmark Town, West Tisbury Town, Tisbury Town, Oak Bluffs Town, and the Town of Edgartown). In 1998, the former Town of Gay Head changed its name to the Town of Aquinnah. Be it enacted by the Lieutenant Governour, Council, and Representatives in Grand Court, or Assembly, and by the authority of the same: That the Islands of Martha's Vineyard, Elisabeth Islands, the Islands called Nomans-Land, and all the Dependencies formerly belonging to Dukes County, (the Island of Nantuckett only excepted) shall be, remain and continue to be One County, to all intents and purposes; by the name of Dukes County. Charles Edward Banks, M.D., The History of Martha's Vineyard, Dukes County Massachusetts, Volume I, George H. Dean, publisher, Boston, 1911.